We are back from Thanksgiving break and that means it's time to start making my daughter Christmas themed lunches. Full disclosure, I am a huge Christmas fan. I love the lights, the decorating, the food, the songs, and the movies. Just between you and me, one of my favorite things is setting up my Christmas Story movie lighted village. I know, I'm kind of a Geek. 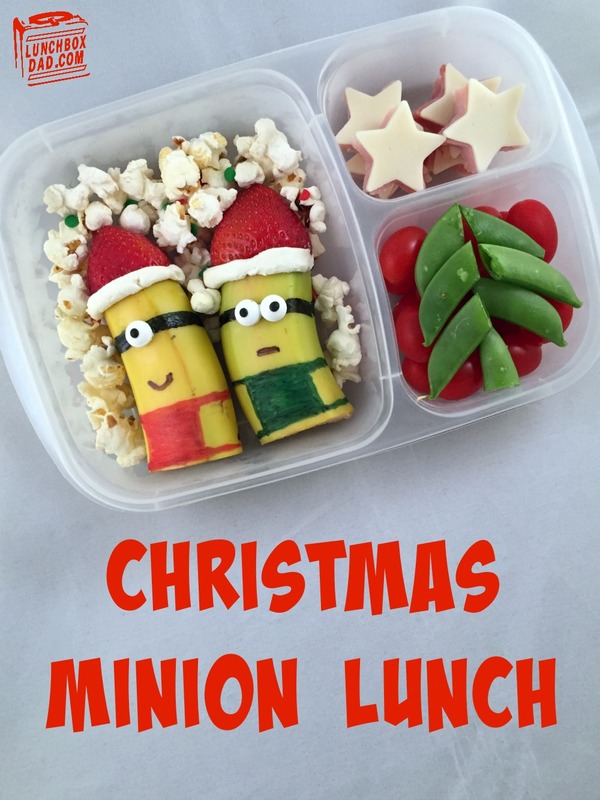 I wanted to do something different with our first Christmas bento lunch so I decided to make a Christmas Minion lunch from Despicable Me. The idea came from the Minions Christmas carol video that has been making the rounds. 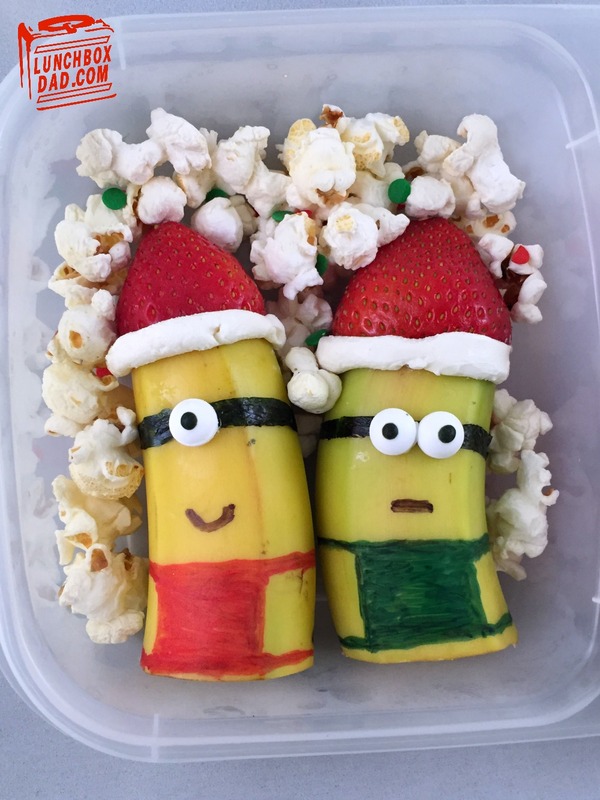 My kids thought it was hilarious so I took what I did in my minion lunch from last year and gave it some Christmas cheer. This was so easy and the minions literally took just a couple minutes to make. They would be great as a standalone Christmas snack as well! I made this in an Easy Lunch Boxes Container and also included a Christmas Lunchbox Love Note (see below). Make sure and follow me on all my social media channels so you don't miss any Christmas fun, recipes, tips, and product reviews! 1. Cut banana in half and the ends off of each piece. Cut the tops off of the strawberries. 2. Insert toothpick halfway into banana end. Put strawberry upside down on top so the toothpick holds the strawberry Santa hat on as shown in picture. Roll a small amount of cream cheese into a small "snake" and press around the strawberry/banana seam for a hat brim. Roll a little cream cheese into a ball and place on top of hat. Hold in place with a toothpick. 3. Cut two small strips of nori and wrap around each banana. Moisten to get it to stick. Use a small amount of cream cheese on the back of each candy eye and stick on top of nori. to complete the goggles. 4. Draw on mouth and overall details using marker. Marker will not bleed through the peel but if you are worried use food coloring marker. Place bananas in main dish and surround with popcorn. Use sprinkles for decoration if desired. 5. Cut star shapes out of ham and cheese. Use can use a shaped cutter to make it very easy. I had ham leftover from dinner so I used that, but you can use any meat. Place these in side dish. 6. Slice snap peas in half at an angle. 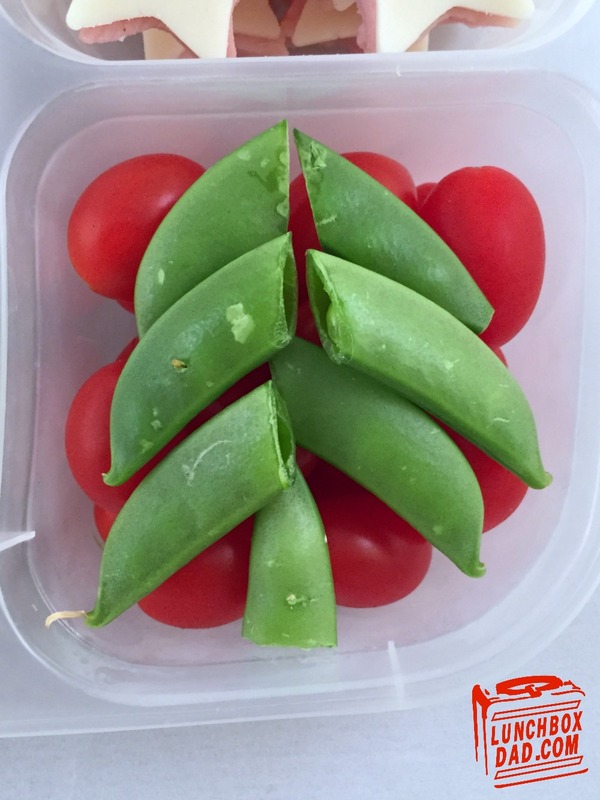 Place grape tomatoes in side dish and arrange snap peas on top in tree design. Use a few toothpicks to hold in place if you need to. 7. 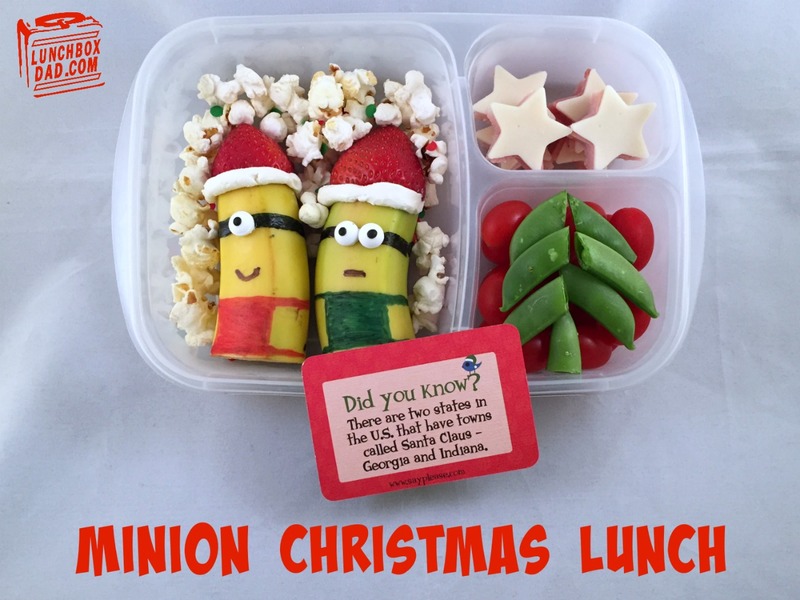 Finish by placing a Christmas Lunchbox Love note in the lunch as shown below!